O.K. Seriously! Do you get any cuter? I don't think so! 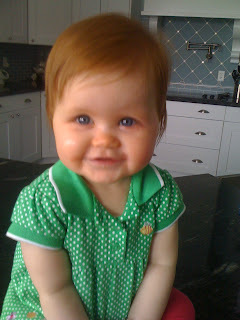 As much as you want to pinch her, you can't, because she is wearing green! 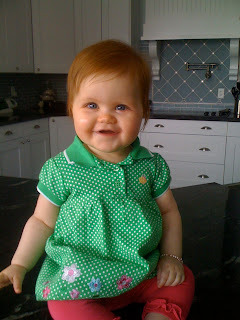 I just love this little red headed beauty more than I can express. 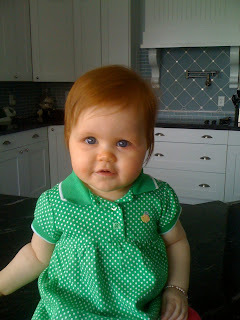 Happy St. Patrick's Day from Chloe Mae. 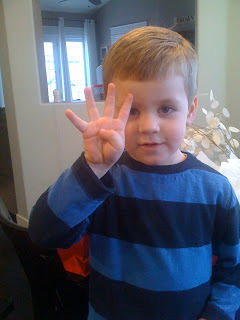 On March 2nd Aidan turned 4! It is crazy to think that it is true! He is such a fun kid, with a wicked sense of humor! He makes me laugh everyday! I love him! 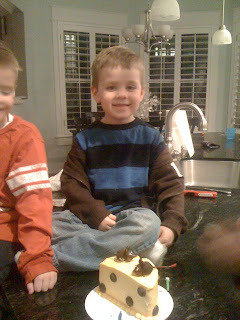 His ice cream cake with two mice on what looks like a block of cheese. He picked it! 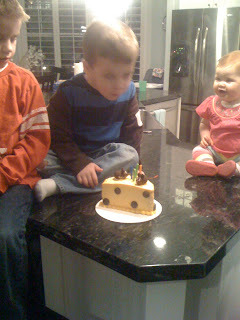 Blowing out the candles. Chloe is impressed! All Aidan wanted for his birthday was every Lego ever made, so he had to settle for four. 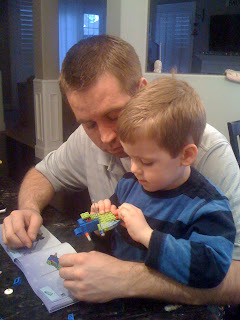 Dad and Aidan building his Legos. 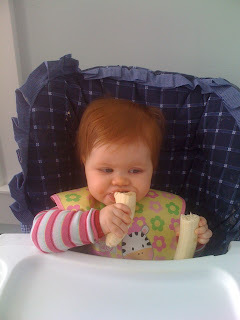 This little one loves her banana! 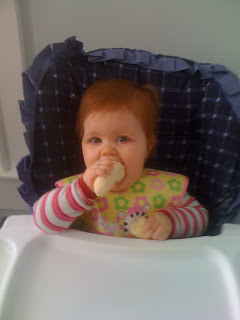 She will eat a whole banana every morning. She chows down on the whole thing. She gets so excited when she sees me peeling one. It just makes me laugh. These two just love each other! Aidan is so cute with her and Chloe just lights up whenever she sees him. I love watching Aidan with her when he doesn't know that I'm watching because he is so good to her. Friends for life! What's better? 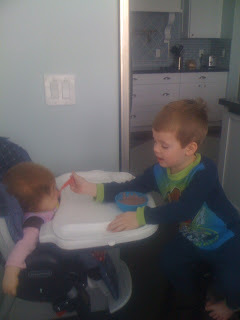 Aidan loves to help out, especially when it comes to Chloe. 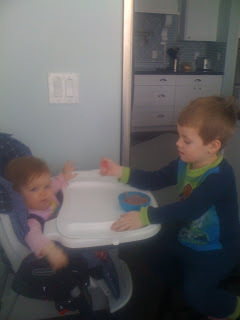 Here he is feeding her breakfast. 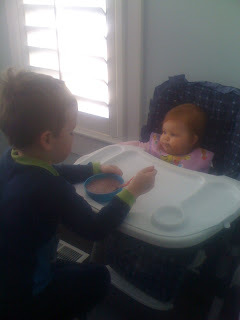 He is such a great big brother. And she loves her Aiders! What a lucky girl! She's a Sagittarius who enjoys men, late 80's T-bird's, a good boxed wine, and always a good time! 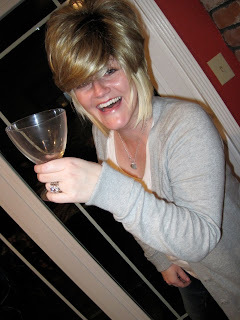 We all had so much fun dressing up in my mom's wigs! When times are tough you got to laugh, and laugh is what we do best! 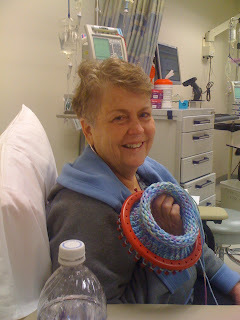 The first of February was my moms start of chemo. And I was so glad that I could be there for it. Paige came a few days later for her second round. Although she was getting hooked up with poison, we still managed to have some fun... nothing can really stop us women! Chloe, me, Paige, and mom. 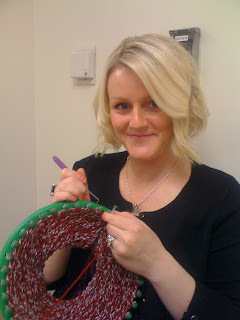 knitting a beanie at chemo. Partying up with a woman who just got home from surgery! Woo woo! The kids had a fun New Years at grammies and papa's! Ben, Aidan, Joel, and Carter going crazy into the wee hours of the morning. Surprisingly this was the first time I have ever taken the boys to get their hair cut. I normally just do it. So when I was home at Christmas time my mom and I took them. 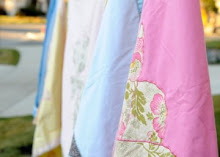 And they were awesome! Aidan after. He did not want any spikes!!! And Chloe just waiting with Grandma. When we were home at Christmas time we went and saw the lights at the Temple. This is also where Aidan thought that the animals ate baby Jesus. Let me explain, papa Mark and Aidan were looking at the nativity and Mark asked Aidan if he could see baby Jesus, in which case Aidan replied, "No, I think the animals ate baby Jesus." The nativity was all white and it was kind of hard to see who was who. 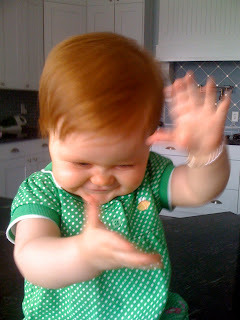 We told Aidan if that had happened things would have turned out a bit different. Ha, ha! The boys were so excited. This year was really great because they were so into it! And to top it off, my mom was there to watch it all! I went out to Cali in Mid December for my moms surgery and then decided to stay out there for Christmas. Joe and the boys drove out and met me and Chloe there and we spent Christmas with my family. It was a Christmas miracle because my mom came home from the hospital on Christmas Eve after only being there for one week after major surgery. It was awesome! We didn't expect here home that soon. This is the Sunday before Christmas after church. Carter and Aidan getting ready to go sledding at the golf course. oh wait, it's just Aidan in my sunglasses. At the carousel in Salem Oregon over Thanksgiving.